Join the ranks of legal and business professionals who subscribe to COGENCY GLOBAL's Corporate Transactions and Compliance blog to receive helpful information you can use, delivered right to your inbox. The COGENCY GLOBAL blog covers a wide range of topics related to transactional and entity compliance issues. Topics include corporate filing/retrieval, M&A, annual/periodic reports, due diligence, legalization/authentication of documents for use in international transactions, nonprofit issues and much more. Delaware's Alternative Entities - On the Cutting Edge of Business Trends. Online Filing Now Available for New York Biennial Reports. Registered Agent Services: 5 Things You Must Know. Practical Considerations for Effecting a Timely Merger or Conversion. 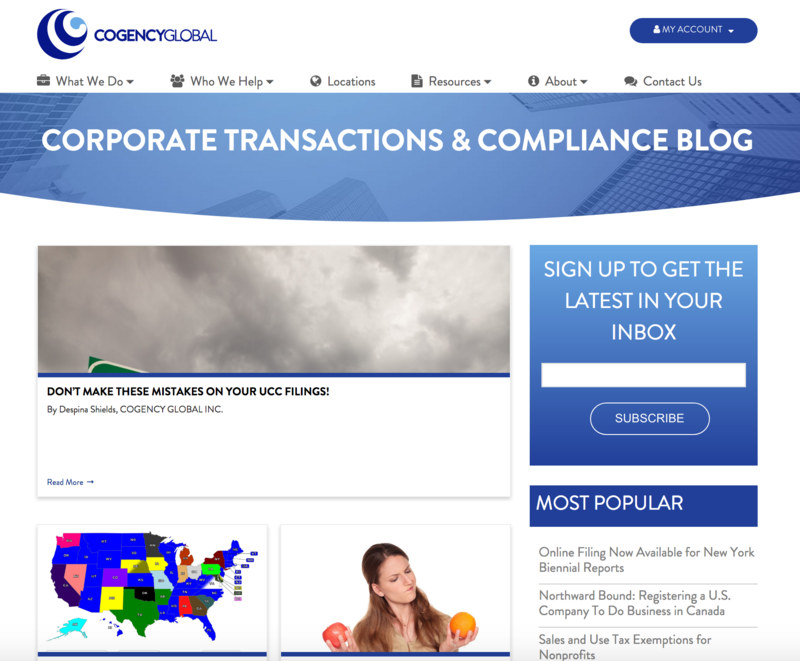 Subscribe to the Corporate Transactions and Compliance blog today!